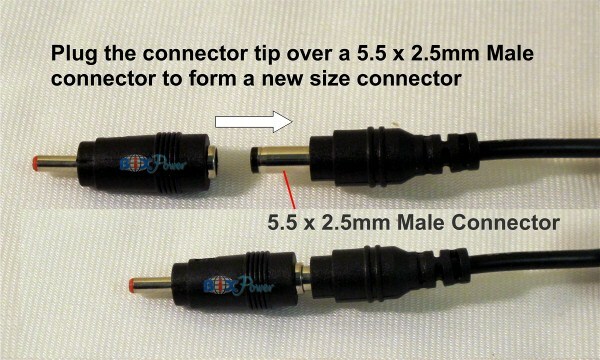 8 different size DC power straight connector tips kit - All with 5.5 x 2.5mm Female Jack. For universal AC and DC power adapters, external batteries. #1: 6.5mm (O.D) X 4.5mm (I.D) with Center Pin.This connectors works for a lot of Fujitsu, Panasonic and Sony laptop computers. #2 : 6.3mm (O.D) X 3.0mm (I.D). This connector works for a lot of Toshiba laptop computers. #3 : 5.5mm (O.D) X 2.1mm (I.D). Works for a lot of electronic devices. #5 : 5.5mm (O.D) x 3.3mm (I.D) with Center Pin.Works for a lot of Samsung laptop computers and other devices. #6 : 4.75mm (O.D) X 1.75mm (I.D) .Works for some a lot of electronic devices. #7 : 4.00mm (O.D) X 1.70mm (I.D) . Works for some a lot of electronic devices. O.D. means round shape connector outside diameter. I.D. means inside diameter.